This sleek, stylish, all-purpose, all-season silk aviator scarf has been a knockout favorite with high-flyers of every era — acclaimed and desired equally by men and women. Double-layered Silk Charmeuse. Find out what made this classic, all-purpose, all-season silk aviator scarf a knockout favorite with high-flyers of every era. 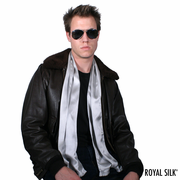 This sleek, stylish, all-purpose, all-season Royal Silk® Aviator Scarf has been an unrivaled fashion favorite with high-flyers of every era - acclaimed and desired equally by men and women of Hollywood and Bollywood. 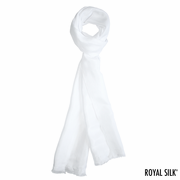 Soft, smooth, and supple, this silk scarf is amazingly comfortable, versatile and functional. It will serve you well day in and day out and all year round as well. You will find that pure satin silk by Royal Silk® is surprisingly warm in cold weather and gracefully cool in warm weather. The creamy satin silk is beautifully double-layered and crafted on both ends with handmade fringes. 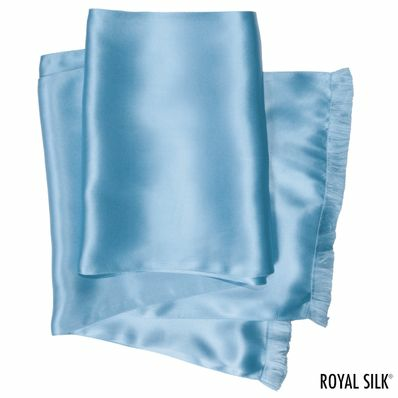 This silk washes well and is easy to care for. It will last you many, many years. Imported from India.